The Butterfly is a symbol of the Resurrection and Eternal Life. As the butterfly leaves the pupa and soars upward with a new body, so through Jesus Christ are His followers borne to a new life. The Daisy is a symbol of Christ’s Innocence. Jesus Christ is the “Chief Cornerstone” as declared in Ephesians 2:20. The IHC is the abbreviation for the Greek word meaning Jesus. The additional symbols in the design also represent Jesus Christ - The Alpha and Omega meaning the beginning and the end; the Cross and the Crown – Victory over Death; the Chalice and Host – the Body and Blood of Christ. The Coronation of the Blessed Virgin Mary is represented by the Crown. As a symbol of royalty, the crown symbolizes Mary as the Queen of Heaven. A starry nimbus is used in Christian symbolism to distinguish the Virgin Mary from other persons in pictures. The Twelve Start and the Crescent Moon are reflective of the scriptural reference to the Blessed Virgin Mary found in Revelations 12:1. The Feast of the Queenship of Mary is Mary 31. The Creation is symbolically represented by the forms of life depicted in the water, on the land, in the airs, and in the sky. The sun radiates, forming a Cross, signifying God’s Presence over all creation. The upraised Arms of Man acknowledge the beauty of the earth and the magnificence of the Creator. The Flight into Egypt occurred February 17, fifty-five days after the birth of Jesus, when King Herod’s soldiers approached close to the cave at Bethlehem where the Holy Family was staying. St. Joseph, Our Lady and their Divine Child set out for Egypt to flee the slaughter of little boys. The town to which they fled was called Fostat, near Cairo, but 300 miles from Bethlehem. Fostat is near Helipolis, a city in which statues of pagan gods collapsed when the Holy Family passed. The symbols of the PX, the Marian Monogram, and the Chisel, Hammer, Walking Staff represent Jesus, Mary and Joseph; the Palm Tree and Pyramids represent the flight to Egypt. The Feast Day is February 17. This window depicts portraits of Mary, Jesus and Joseph. The feast celebrating the dignity of the Holy Family is observed on the Sunday within the Octave of the Christmas. The carpenter's square is indicative of Joseph's trade. The three rayed nimbus shows Jesus' divinity. Mary was from the first instant of her conception, without original sin. God created the soul of Mary in sheer holiness. Pope Pius IX declared the Immaculate Conception of Mary as a dogmas of the Catholic Faith on December 3, 1854. Symbolism: Dove – Holy Spirit, through whose power the miracle of the Immaculate Conception; Crescent Moon – Virgin. Mary Queen of the Rosary is the title given to Our Blessed Mother, honoring her promotion of the Holy Rosary as a lovely instrument of prayer. The recitation of the rosary directs our minds and our hearts to God as we move our mouths and our fingers while we pray. Mary personally presented a rosary to St. Dominic in 1214 in Toulouse, France. The Feast of the Most Holy Rosary is October 7. The symbols in this window are: Monogram of Mary which shows the letters A, M & R which churchmen of medieval days interpreted as AVE, MARIA, REGINA or Hail Mary, Queen. The Mystic Rose, either white or pink is a common symbol of the Virgin Mary, indicating hope, love or purity. The Rosary draped on the Monogram of Mary indicates Mary’s promotion of praying the rosary. The Cross represents Christ, her sacrificial Son. The Sacred Heart of Jesus is a moveable feast in the Church, but must be commemorated between May 29 and July 2. It is celebrated to venerate the loving kindness, compassion and forgiveness of Our Lord Jesus Christ. The flame atop His Most Sacred Heart symbolizes the constancy of Christ’s love for us. Imposed upon the Sacred Heart are the cross and thorns, symbolic of Christ’s passion, done out of love for us. The Immaculate Heart of Mary as a feast of commemoration of Our Lady was first instituted in 1644, but was given to the entire Catholic Church in 1944 by the late Pope Pius XII. The actual feast day of the Immaculate Heart of Mary is August 22, but the entire month of August honors Mary’s Immaculate Heart. Her heart pierced with a sword symbolizes the prophecy uttered by the aged Simeon, “Yea, a sword shall pierce through they own soul also.” Luke 2:35. Mary’s Immaculate Heart has been called “The Furnace of Divine Love”. The Monogram symbolizes the Virgin Mary, and the Mystic Rose, either pink or white, is a common symbol of the Virgin Mary representing love and hope. St. Agnes, Virgin and Martyr, was a dedicated follower of Christ who refused to marry with the claim that she was a “Bride of Christ”. St. Agnes is the patroness of chastity. She was martyred in about 304 A.D. Her feast day is January 21. The following symbols are representative of St. Agnes: Sword and torches are symbolic of her martyrdom by sword: the Lamb on Book indicates her devotion to the Word and Our Lord; the Dove holding a ring symbolizes St. Agnes’ chaste union with Christ. St. Aloysius was a model of virtue to all young boys, and was committed to a crusade for the preservation of purity in thought, word and deed. Member of the Order of the Society of Jesus, and later the Order of St. Ignatius Loyola; born 1568, died 1591. His feast day is June 21. Symbolism: Lilies - purity; the Crown - royalty by virtue of angelic and saintly behavior; and the corpus-St. Aloysius died June 21, 1591, the octave of the Feast of Corpus Christi..
St. Anne is little recorded in history, but she has been honored throughout the Christian Community, particularly in Canada. St. Anne is revered for her careful instruction of Mary, Mother of God. The symbols representing St. Anne are the Angel, and the upraised Crown, both indicating the dignity and holiness of St. Anne. Her Feast Day is July 26. St. Anthony of Padua was a faithful and eloquent preacher against doctrinal error and wickedness, and has been given the title of “Hammer of Heretics.” He professed the Faith in both mind and spirit every moment of his life, joining first the Augustinian Order and then the Franciscans in 1221 with the hope of shedding his blood and becoming a martyr. St. Anthony was a Doctor of the Church. He preached in Italy, France, and Sicily and died in Padua in 1231 at age 36. St. Anthony’s Feast Day is June 13th. The Orb (earth) with Cross upon it represents triumph of His Gospel. St. Bridget was the Founder of the Bridgettines and was Abbess of the Monastery which she founded. ST. Bridget’s symbols are the Heart Charged with a Cross, and a Pierced Heart, representative of the constant visions of Our Lord’s life, death and passion which she experienced for a year before she died. The Open Bible and Dove are representative of St. Bridget’s acceptance of the Divine Word, and Divine Inspiration. Her feast is Oct. 8. St. Dominic was the Founder of the Dominican Order known as the Order of Preachers. He was born in Spain in 1170, and died at the age of 51. Through the intercession of St. Dominic of Silos Dominic was conceived, and thus given the name of his intercessor. The great apostate of St. Dominic was that of the Most Holy Rosary. He received the Holy Rosary by the Blessed Virgin Mary herself In Toulouse, France. Thus the rosary in the design. The Books in the Fire represent the Preaching of the Work of God with Spiritual Fervor. St. Dominic’s feast is August 4. St. Elizabeth Ann Seton was the first American-born saint, canonized in Rome in 1975. Born in 1774, Elizabeth Ann Bayley embarked upon a life of marriage, parenthood, teaching and service to the poor, windowed and orphaned. Elizabeth herself became widowed with five children at age 29. Converting to Catholicism soon after her husband’s death, Elizabeth started a school in Baltimore, Maryland. Soon thereafter, she took religious vows, and joined by other young women, she started the American Sister of Charity. The small group moved to Emmitsburg, Maryland in 1809 where the order increased in numbers. Elizabeth Ann Seton’s life, perseverance, and devotion offer to all, especially to women, a wonderful role mode. The SC and flaming heart are symbols of the Sisters of Charity. St. Elizabeth of Hungary was princess of Hungary. She married Louis of Thuringia, and had three children. After his death, Elizabeth became a Franciscan. She is the patron saint of the Third Order of ST. Francis. She died when only twenty-four years old. Four years after her death, St. Elizabeth of Hungary was canonized. The dead have been raised to life when brought to her tomb. One day Elizabeth was carrying bread and drink for the poor, (the basket of bread the flask) her husband met her and looking under the mantle saw only roses. The three crowns symbolize she married into royalty and was a virgin, wife and a widow. St. Francis was called by Pope Benedict XV the “greatest image of Our Lord that has ever been”. Francis founded the Poor Clares, the Order of Friars Minor, and the Third Order of St. Francis (for the sanctification of lay people.) He was given the stigmata while praying in 1224. Born in 1182, he died in 1226. His feast day is October 4. Symbolism: Stigmata - wounds in the hands of St. Francis duplicate those of Christ at the Crucifixion; Birds – indicative of Francis’ appreciation of and spiritual connection with nature; Corpus – St. Francis’ closeness in image to Christ. St. James the Apostle, was called “greater” because of his larger size than St. James the Less, or Minor. St. James Greater is the brother of St. John the Evangelist. St. James was the first Apostle to be martyred (beheaded). His feast day is July 25. Symbolism: Scallop shells - pilgrimage, zeal and missionary spirit; Pilgrim’s staff – pilgrimage; Crown and palm leaves – martyrdom. St. Joseph the Worker is reverenced in the Church not only as the virginal spouse of the Blessed Virgin Mary, but also as the Patron and protector of all worker. St. Joseph was a carpenter by trade, as symbolized by the square, the saw, and the chisel. The rod blossoming with lilies is representative of St. Joseph, symbolizing his purity and virginity. The dove symbolizes the peace, purity, and modesty of St. Joseph. The feast days of St. Joseph are twofold: March 19 commemorating his death, and May 1 commemorating his being Patron of Workers (May Day). St. Luke was a doctor of medicine in Antioch, Syria, He was a convert to Christianity and became a disciple of St. Paul. St. Luke is the Gentile who wrote books in the New Testament. He alone wrote of the incarnation, Birth and Childhood of our Lord. The open Bible represents St. Luke as Evangelist, and the Winged Staff represents the rising of mankind to a higher place since the Fall of Man, through medicine. October 18 is his feast. St. Nicholas of Myra is honored as the Patron Saint of Children and is thus symbolized by the three children in a trough. He raised three children from the dead represented by the three golden balls. The small church represents the place in Bari, Italy where St. Nicholas’ relics lie in honor. The true St. Nicholas has been corrupted into the commercialized “Santa Claus”, but those who love him venerate him as a saint, not as an advertisement. He is also the Patron Saint of Russia. His feast day is December 6. St. Patrick is symbolically represented by the Mitre which is a headdress worn by Bishops and the Pope. Patrick is often pictured in his green decorated chasuble, partially depicted here. The snake intertwined on a Bishop’s Crosier (staff) represents the expulsion of snakes from Ireland by St. Patrick. Shamrocks are representative of St. Patrick and the Trinity. His feast is March 17, and St. Patrick is one of the Patron Saints of Ireland. He died in 493. St. Raphael is known as the angel of Our Lord, and the guardian angel of all humanity, and is one of our special helpers in time of sickness and the hardships which go with it His feast day is October 24. He is also the Patron of travelers. Symbolism: Gourd and walking staff - identify Raphael as the Angel who appeared at the Pool of Bethesda. St. Rose of Lima,Peru, is the Patroness of South America and the Philippines. She was the first saint canonized who was born in the New World. Her Baptismal name was Isabel, but because of a miraculous rose seen over her head one day, and because of the beautiful flower like charm of her face, she was confirmed and called ROSE. St. Rose joined the Third Order of St. Dominic. She always wore a spiked crown concealed under a wreath of roses, worked by day making lace and embroidery to support her family, and imprisoned herself by many acts of sacrifice – thus the symbols in her window. She died in 1617 at the early age of 31. The Feast of St. Rose of Lima is August 30. Now as he was approaching the slope of the Mount of Olives, the whole multitude of his disciples began to praise God aloud with joy for all the mighty deeds they had seen. What if God Should Go on Strike? On behalf of the community of faith that is St. Dominic Parish I welcome you to our website. We are followers of Jesus Christ in the Roman Catholic tradition. Our parish and school staff are dedicated to fostering and nurturing the spiritual growth and formation of the members by providing opportunities for worship, an excellent school for our children (Pre-school-8,) a parish school of religion (Pre-school - 8,) and a wide variety of religious, educational and social programs for our adults and youth. Our Christian family is committed to serving the needs of the sick, the afflicted and the poor in our neighborhood. 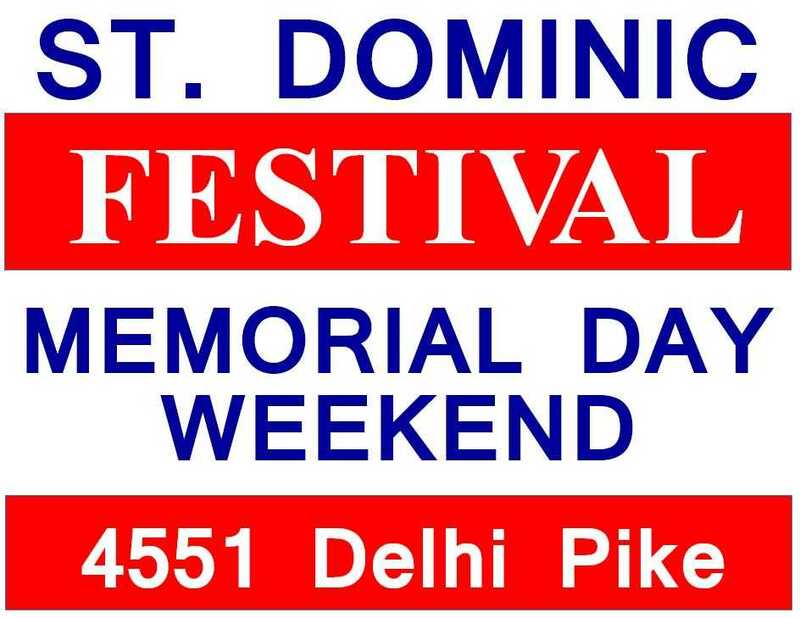 If you have no religious heritage or church family to call your own, we cordially invite you to investigate St. Dominic Parish to discover how it can enrich your life. If you would like to contact us, feel free to call (513) 471-7741. We look forward to hearing from you. Every Saturday, 8:45 a.m. to 9:30 a.m., or by appointment.